In 1989, after I had fled from Kabul in late 1987, the American Center in Peshawar, Pakistan, provided me with a Fulbright grant to write my prison memoirs at the East-West Center in Honolulu, Hawaii. Before doing so, I went through the journal that I kept from 1979 until the Kabul regime arrested me in 1982. By reviving the events of the period in my mind, the journal proved so impressive that I decided to write instead a political history of the period. The result is this work, the first draft of which I composed during the six months of my fellowship with the center. I acknowledge my special indebtedness to Kent Obee, director ofthe United States Information Service in the American embassy in Islamabad; Richard Hoagland, head of the American Center in Peshawar; and John Dixon, director of Afghan Section at the U.S. Information Agency in Washington, D.C. These three men made the Fulbright grant possible. During my stay in Honolulu, Mr. Dixon also provided me with press clippings on Afghanistan, for which I am also grateful. In the East-West Center, Mr. Robert Hewett (director of the center), Meg White, Mrs. Joy Teraoka, and Joyce Gruhn were very helpful, and I am grateful. I also wish to thank Professor Alden Mosshammer, chair of the History Department of the University of California, San Diego, for giving me access to the main library of the university, which enabled me to broaden my vision of the subject. I also want to thank David Christine, a computer specialist neighbor from New Zealand who helped me learn the computer technique while editing the work. His ready help eased my work very much for which I am grateful. I also want to express my thanks and appreciation to Stanley Barton for going through the manuscript and making useful suggestions regarding its style and editing. First as my student in a course on contemporary Afghan history that I taught at UCSD, and subsequently as my friend, Mr. Barton has been very helpful indeed, for which I am thankful. My gratitude also goes to Dan Gunter for his thorough editing of my work and to the University of California Press for making my work accessible to the readers. Last but not least, I am grateful to Mr. Zamin Mohmand for sending me press clippings on Afghanistan and the region. Landlocked Afghanistan links Central Asia with South Asia and, to some extent, with West Asia or the Middle East. The latter is also connected through Afghanistan to China. In this important crossroads have lived from ancient times many ethnic groups, known in recent times as Afghans. They speak about thirty languages and dialects belonging to four main linguistic groups: Indo-Aryan, Turkic-Mongolian, Semitic, and Dravidian. The Indo-Aryan languages Pashto and Dari (Afghan Persian) serve as lingua francas, hence the significance of their speakers, that is, Pashtuns and Tajiks. These two groups constitute the overwhelming majority of Afghanistan’s inhabitants, who numbered 15.5 million in 1979. Among these groups, in particular the Pashtuns, bilingualism is high. The Pashtuns outnumber all the other groups combined. For centuries the Pashtuns have played the dominant role in politics. Their main division, the Durrani, provided Afghanistan with the ruling dynasties of Sadozay in the eighteenth century and Mohammadzay from then until recently. The main Turkic group is the Uzbeks, who speak the Uzbeki language. Just more numerous than the Uzbeks are the Turko-Mongol Hazaras, who speak Dari and adhere to the Shi’ite faith of Islam. Ethnic identity among the illiterate Afghans who constitute the majority is strong. Pashtuns, Tajiks, Uzbeks, and Turkomen have kin in the neighboring lands of Pakistan, Iran, Turkmenistan, Uzbekistan, and Tajikistan. They also share with them the religion of Islam. Except for the small group of Afghan Hindus and Sikhs, about 90 percent of Afghans are Sunnis and 10 percent Shi’as. The ratio of ethnic groups is unknown because of the inroads of the main languages in each other’s domains, particularly in the mixed areas where Pashtuns and Tajiks have lived for thousands of years and where intermarriage is common, as it is among the educated Afghans. This and the universalist religion of Islam, the assimilation of ethnic minorities within the dominant linguistic and ethnic communities, and the economic interconnectedness of regions, which is the result mainly of the introduction of a modern transportation network, have softened the notion of ethnicity and contributed to the solidarity of Afghans as a nation. The centuries-old dynastic rule and the enforcement throughout the land of a unified set of laws by a central government through a bureaucracy backed by a national standing army have also worked in the same direction. An ancient land, Afghanistan has a long and eventful history. Its neighbors have influenced its history as it has theirs. Afghanistan has, mainly in its outlying regions, people of common descent with those of its neighboring countries. They were officially separated from each other when Afghanistan’s boundaries were delimited in the second part of the nineteenth century. The boundaries, particularly that with Pakistan, are precarious. The latter was marked by the so-called Durand Line, which separated Afghanistan from its own Pashtuns, that is, the ethnic majority that had played a leading role in creating Afghanistan in the eighteenth century. The boundaries were then (and still are) so artificial that when people on either side of the line were hard-pressed for any reason, they crossed the line and settled across the border among their ethnic and coreligionist brothers. Besides, about two million Pashtun nomads crossed the Durand Line twice a year as a matter of course. The line was officially observed, although the Afghans did not truly accept it, and their successive governments, particularly after the British left India in 1947, helped their Pashtun brothers on the other side of it to constitute an independent land of their own, Pashtunistan. This meant that the frontier problems, particularly the Pashtunistan issue, deeply affected the political as well as diplomatic history of Afghanistan. The frontier problem is thus an important element of Afghan history. Also important for Afghan history was the fact that two major European colonial powers, Russia (later the Soviet Union), and Britain, controlled her neighboring lands in the north and southeast. In the nineteenth century both powers grabbed vast territories from Afghanistan, reducing it to its present size; they then looked on it as a buffer state. Britain was the more aggressive, warring with Afghanistan three times (in 1838, 1878, and 1918), conducting foreign relations for it (1880-1918), and imposing the aforementioned Durand Line (1893). Seeing their country reduced in size and sandwiched between two “infidel” giants, the Afghans became xenophobic, inward-looking, and jealous of the independence of their country. The dawn of the new century coincided with the opening of Afghanistan to the outside world, the introduction of modern education, and the emergence of a small but assertive educated and bureaucratic middle class that was nationalist and constitutionalist in outlook. In the age of revolutions elsewhere, the prolific anti-imperialist journalist Mahmud Tarzi led the way in the domain of thought and propaganda. But after Afghanistan’s successful war of independence, when the new reformist King Amanullah (1919-29) began to implement the first radical comprehensive schemes of modernization, they proved to be unrealistic and unpopular. They made him so unpopular that finally in 1929 a social bandit, Habibullah, commonly known as Bacha-e-Saqqao, overthrew him. With his downfall ended Afghanistan’s first constitution, which Amanullah had promulgated in 1923, as well as the dynastic rule established by his grandfather Amir Abdur Rahman in 1880. As the new ethnic Tajik amir, Habibullah ruled for only nine turbulent months. Mohammad Nadir, a former military general of another Mohammadzay section of the Pashtun Durrani tribe, toppled the new amir in October 1929 and established his own dynasty of the Musahiban or Yahyakhel section. The failure of the reforms and the rule of a Tajik amir for the first time in modern Afghanistan had serious repercussions that became manifest during the reign of King Nadir (1929-33). The Pashtun-Tajik relationship became strained for a while, and the conservative elements, represented by spiritual leaders and tribal elders, were granted scores of concessions and high positions in the government. Scholars and writers were organized in a new literary association, and religious scholars in a new association of the ‘ulama. Modern education was reintroduced, though on a smaller scale, and the foundation for the future Kabul University laid down, but female education was neglected. Government-controlled dailies and weeklies were established in Kabul as well as provincial capitals. Some of the many supporters of the reformist king and the smaller group of constitutionalists were suppressed; others were imprisoned, and a few were even executed. Although he established a family rule by granting high posts to his four brothers and other relatives, King Nadir structured the government on the basis of a new constitution. Instituted in 1931, it provided for an elected National Consultative Assembly and an appointed House of Elders. The monarchy was called constitutional. But the new nation-building movement came to an abrupt halt in November 1933, when a student shot the king dead. The sudden death of the top person of the new dynasty did not create chaos, although a number of pro-Amanullah, constitutionalist, and anti-British radical Afghans known as the “Young Afghans” had carried out terroristic attacks against its members for some time (one had killed the eldest brother of the late king). They accused the new rulers of being under British influence. The situation was brought under control when Shah Mahmud, the minister of defense and a brother of the late king, arrested the assassin and declared the nineteen-year-old Mohammad Zahir, the only son of the late king, the new ruler. The notables followed him in paying homage to the new king. No other change took place, and the late king’s three brothers and nephews, led by Mohammad Hashim Khan as prime minister, ruled the country uninterruptedly for thirteen years until 1946. Prime Minister Mohammad Hashim Khan worked tirelessly in maintaining law and order. He did not tolerate opposition, although he allowed provincial assemblies and the national parliament to function as provided by the constitution. Their members, however, were handpicked. He permitted King Mohammad Zahir, his nephew, to enjoy life, but not to rule; by contrast, he trained his full nephews, Mohammad Daoud and Mohammad Na’eem, in the art of government by giving them responsible positions. The assassin and his nearest relations were executed and scores of others imprisoned. With the help of the intelligence service (zabt-e-ahwalat) backed by a strong army, the government arrested many constitutionalists and other persons, often for no apparent reason; they were detained in filthy prison cells for years without trial. After the late king was assassinated, the ruling circle had decided not to execute its opponents for fear of revenge. Notable progress was made in the national economy, which had been destroyed during the rebellion. Masterminded by the businessman Abdul Majid Zabuli, a banking system was introduced, and joint stock companies for export and import were set up. By 1946 more than fifty such companies operated.4 The resulting accumulation of capital made it possible for the National Bank and private companies to set up a number of factories for textile, woolen, sugar, and fruit processing. Cotton and sugar beets were grown in vast areas brought under cultivation in Qunduz in the northern part of the country. This region was connected to the southern part of the land for the first time by a vehicle-passable road crossing the Hindu Kush, an accomplishment that helped make these developments possible. Zabuli’s success was partly due to his policy of making members of the dynasty, in particular the prime minister, partners in business. Unwilling to grant concessions to its immediate neighbors, the government failed to obtain from distant governments and private companies major credits or capital for investment, in spite of the fact that it offered favorable concessions to the American Inland Exploration Company for the exploration and exploitation of oil and mineral deposits.5 Deterrents were Afghanistan’s distant, landlocked position, its difficult regions, its primitive transportation system, and, above all, its closeness to the Soviet Union. Only Nazi Germany, from 1937 onward, undertook to survey mineral deposits and extend a large amount of credit for Afghanistan to purchase German machinery. Germany sent a large number of specialists to Afghanistan, but they, along with others from Japan and Italy working on smaller projects, were expelled under pressure from the Allies during World War II.6 Advised by a loya jirga (grand assembly), Prime Minister Mohammad Hashim followed a policy of “correct neutrality” during the war. After the war, when conditions both at home and abroad had changed, the king asked him to step down; thus ended Prime Minister Mohammad Hashim’s long, suppressive rule. A brief democratic interlude followed. Mohammad Daoud (1910-78) served as prime minister for ten years, 1953-63. During this decade Afghanistan experienced fundamental changes that were initiated more under his direction than under either his brother or the king. From the age of eighteen Daoud held more military positions than civilian. Like Amanullah, Daoud was a reformist, but he also stood for law and order. He introduced changes through the state, not individual or corporate channels. However, the state he relied on was not totalitarian but authoritarian. He disliked the notion of a democratic state based on individual freedom. With the rise to power of Mohammad Daoud, the nongovernmental press ceased publication, and political parties became inactive. Elections for the national assembly were held, but they were manipulated. Once again the intelligence service (masuniyat-e-milli) was expanded as it had been under Prime Minister Mohammad Hashim. In 1957, when first a cabinet minister along with his colleagues and later a number of dissidents were arrested on flimsy charges, the sense of security that had prevailed with the beginning of the democratic interlude evaporated. But progress in the economic field was visible. It started with the launching of the first Five-Year Economic Development Plan in 1957, financed partly by a Soviet loan of $100 million; a second plan was launched in 1962. Under the plans the main roads throughout the country were paved, some hydroelectric dams built, irrigation projects launched, education and health services improved or expanded, and some industries developed. Agricultural and commercial development banks were also set up. The expanding bureaucracy absorbed the increasing number of educated elements, as the state traditionally had undertaken to employ such people. But the overall development fell short of the targets originally set under the system of a “guided, mixed economy” because of the lack of statistical data, insufficient capital, and a shortage of qualified personnel. In fact, the economic development schemes were the almost total concern of the state, not of private development banks or companies, whether foreign or indigenous.9The foundation of the planned development was laid down, and the state became more comprehensive than ever before. Also, since the plans were financed mainly by foreign credit, the country was opened to foreign influence. No longer was Afghanistan the isolated land it had been traditionally. In 1959 women were allowed to unveil. The unveiling proceeded smoothly in Kabul because of the increase in the number of educated women, who worked mainly as nurses, midwives, and teachers. The desire to unveil had become a marked tendency, particularly among the intelligentsia. Also, the government did not make a provocative fanfare on the occasion as did Amanullah in the 1920s, nor was the unveiling compulsory. When women members of the dynasty and spouses of senior government officials appeared unveiled in public functions, others followed suit. Only in the city of Kandahar did people rise up, but the rebellion there was due to the stupidity of the governor, whose tactless attitude regarding the unveiling provoked strong reaction. The revolt, suppressed at a cost of about sixty lives, remained local. The government was capable of dealing with such emergencies, since it had already equipped the army with modern weapons obtained from the Soviet Union. Except for a few cases, the government did not interfere in the elections, and the two elections that were held in 1965 and 1969 produced representative national assemblies. The majority of their members were from the rural secular and religious elite, mainly interested in pressuring the executive to further their own interests and those of their own constituencies. Most had won their seats by spending money. Members of the educated middle class had little chance of success in the elections. Among the national and liberal democrats, who were elected mainly from the urban constituencies, a few were leftists, and four of the urban members were women. Thus, contrary to the spirit of a liberal constitution, the assembly was dominated by nonliberals and nondemocrats who did not know the workings of the constitution. They often failed to form a quorum and frequently fought the government, a situation that contributed to instability. In contrast with the past, in the constitutional decade the governments—or, more precisely, the executive branches—had short lives: an average of two years for each of the five governments. They were also weaker, with no basis of power of their own; they had only the king to rely on. But the king, though supported by his younger son-in-law and cousin, Abdul Wali, and others, now had opponents in the persons of his other first cousins and brothers-in-law, Daoud and Na’eem, who had turned against the new arrangement because it excluded them from politics. Daoud skillfully joined hands with a faction of the pro-Moscow communists in opposition to the government. The king failed either to win him over to his side or to neutralize him. In addition, the government had to meet challenges from the national assemblies and unruly students incited by political parties. Although the political parties were not legal, they were active nonetheless. The government was also exposed to a free and critical press that mushroomed overnight. The king chose premiers from among those whose loyalty to him was beyond question; however, they were not delegated the authority to choose their cabinet colleagues. Also, they did not have control over the army, nor could they stop members of the royal house from interfering in government affairs. One such interference led to the downfall in October 1965 of the first government, headed by Premier Mohammad Yusuf, an ominous beginning. Not all the premiers were qualified. Prime Minister Mohammad Zahir resigned because his government was unable to deal with the emergency caused by a drought in 1972; Premier Nur Ahmad E’temadi was given the post because through him the king intended to mollify Mohammad Daoud. E’temadi was pro-Daoud and also partly anticonstitution. He permitted a faction of the pro-Moscow communists to proceed with their activities whereas he oppressed others, particularly the religious groups. This situation discouraged others from acting against a small but determined number of pro-Moscow leftists who, with others, tried to undermine the democratic arrangement. The king’s failure to sign the Political Parties Bill, the Municipalities Bill, and the Provincial Councils Bill, all passed by the parliament, prevented national, provincial, and municipal governments from taking root. The premiers relied on his goodwill. The king had no privy council and consulted certain dignitaries individually. Anarchy resulted from his failure to grant authority to the government and the latter’s failure to establish a working relationship with the national assembly as well as to deal with the uncontrollable students and the problems that followed a drought in 1972. (Students who were under the spell of mainly subversive leftist parties spent more time in demonstrating than studying.) Only then did the king empower Musa Shafiq, who took bold steps in establishing the authority of the government. The new prime minister accomplished in seven months what others had failed to do in years. He was on the way to resolving the essential problems against which the previous governments had struggled, but before he was able to do so Mohammad Daoud, with the cooperation of pro-Moscow leftist military officers, overthrew the constitutional monarchy and declared Afghanistan a republic in July 1973. The accomplishments of the constitutional decade were many. The most important accomplishment was security from government interference and the freedom to live within the bounds of law. This made it possible for a number of political parties to emerge: the People’s Democratic Party of Afghanistan (PDPA), the Islamic Association (IA), the People’s New Democratic Party, the Voice of the People, the Social Democratic Party, the National Unity, the Progressive Democratic Party, and the National Oppression Party. From the turmoil of these parties, which tended to split into factions, the radical pro-Moscow leftists (the PDPA), and the radical Islamic fundamentalists (the IA) came to the forefront. The IA and PDPA were supported more by their foreign patrons than by their own Afghan constituencies. Parties with no outside patrons and moderate programs did not play a major role: hence the radicalization of Afghan politics and the intolerance and violence in the decades ahead. Also, these events led to the influence of foreign powers in Afghan politics, beginning with the communist coup in 1978. I describe these and other parties in chapters 3, 4, and 5. Mohammad Daoud ruled Afghanistan as president under conditions different from those that prevailed when he served as prime minister. He now had to share power with members of the pro-Moscow communist Parcham faction of the PDPA, whose military wing helped him to usurp power. The suspension of the constitution and the coup created a power vacuum that had to be filled if stability was to become real. In the beginning the vacuum did not create problems, since the king, who was vacationing at the time of the coup in Italy, abdicated in Daoud’s favor. But the coup and his reliance on the communists deprived Daoud of the service of the members of his former ruling dynasty; it also estranged him from the liberals and democrats and the fundamentalists of the Islamic Association. The free press and the security of the constitutional decade vanished. A former premier and leader of the Progressive Democratic Party was arrested, as were his colleagues and some leading members of the Islamic Association; some were executed. Hoping to make Afghanistan more dependent on the Soviet Union, the communists pressured President Daoud to adopt a policy of brinksmanship with Pakistan over the problem of Pashtunistan. The first reaction was shown by the Islamic fundamentalists, who arose in 1975. Though suppressed, the uprising disillusioned Daoud about his comradeship with the communists and his policies in general. He then began to change his internal and external policies. Having consolidated his position, he expelled communists from the ministerial posts. To make his regime legitimate, he summoned a loya jirga of notables in 1977 and asked it to approve a constitution and elect a president for the republic. The jirga passed the constitution and elected him president for seven years, but the intrigues that were played even by Daoud damaged his credibility. Besides, a one-party system was introduced that was to be led by the official National Revolutionary Party, a bunch of bureaucrats. This system made the democratic rights granted by the constitution meaningless. Also, the president gave key posts in the new cabinet to minions of doubtful loyalty. Later a criminal code was enacted that banned political activities and empowered security officials. Although not acted on at the time, the code created fear, particularly among the communists for whose suppression it had been enacted. In 1977 a series of terroristic attacks by Islamic fundamentalists and leftists disturbed the peace in Kabul. On 17 April 1978 Mier Akbar Khybar, a prominent member of the PDPA, fell victim to such an attack. The PDPA’s leaders held a funeral procession in which some spoke against the government. Since the procession was a demonstration of strength and in violation of the criminal code, the government took action. On 25 April 1978 the police detained seven members of the PDPA’s politburo as ordinary prisoners in the mud-walled prison cells in the center of the city. The police delayed arresting Hafizullah Amin, a military liaison officer of the Khalq faction of PDPA, until the next day, when they searched his house. This gave Amin time to draw up a plan of operation for overthrowing the government, an order that was carried out on 27 and 28 April, while he was still in prison, by military officers who were almost all Khalqis. Unwilling to submit, President Daoud was killed, as were eighteen members of his family and a number of his ministers. Thus ended the dominance of the Durranis, who had ruled Afghanistan since 1747. The persons now destined to govern had different ethnolinguistic backgrounds. They were a cross-section of society, but as part of the educated middle class, particularly as communists, they had alienated themselves from their origins. None had lofty social standing. Except for Nur Mohammad Taraki, general secretary of the PDPA, they were more or less of the same age and thus unwilling to submit to any of themselves as a ruler. The communist ideology had tied them to the party, the medium of power, but this solidarity reflected more their desire to acquire power than their desire to unite in a common cause—hence their potential for divisiveness. The potential exploded into hostile forces after they became a political ruling class. Besides, most had no administrative experience, but each was convinced that the PDPA blueprint was the guideline for reorganizing both society and state. Thus, they relied on Soviet, not Afghan, experience, and thus, too, they broke with the Afghan past. This may explain why, after they rose to power, they became ever more alienated from their own people and ever more disunited among themselves. As of 1994, the political vacuum they created remained unfilled. Following the coup, the PDPA ruled Afghanistan with Nur Mohammad Taraki as president of the Revolutionary Council, prime minister, and general secretary of the PDPA. Intolerant of opposition, the government began to implement socialistic programs by issuing a series of eight decrees, including the land reform decree, in an authoritarian manner without regard for consensus and social conventions. The government relied on the army, the police, the party, and, of course, the support of the Soviet Union. The government’s socialistic programs, its single-party dictatorship, and the excesses its officials and party personnel committed resulted not in winning over the populace, as it had hoped, but in popular uprisings, all of which the government suppressed, just as it suppressed rival political parties of the right and left. Even within the PDPA, the ruling Khalqi faction suppressed the Parcham faction and sent its leaders abroad as ambassadors, later dismissing them. Within the Khalq faction, too, rifts occurred, and the strong Hafizullah Amin replaced Taraki as head of government and the party. All this weakened the government and made it still more dependent on the Soviet Union. After Amin tried to rule Afghanistan the way Marshall Tito had ruled Yugoslavia, the Soviet Union intervened. What follows in this book is based mainly on a journal of events, written in Pashto and exceeding a thousand pages, that I kept frommid-1979 to my imprisonment in 1982. My prison life (1982-87) gave me an unparalleled opportunity to interview many well-informed inmates, including some Khalqi senior officials. Because I was known to be a historian, many inmates trusted me with information, as did other well-informed Afghans after my release from the prison. I have lived through the period about which, as a student of Afghan history, I was curious to know. This work covers the period from 1979 until 1982. A chapter on the events before the invasion has been added to describe the circumstances under which the Soviet Union decided to invade. Although the period is arbitrary, the richness of events, the abundance of data, and my personal experience of it make it important enough to warrant a separate study. The richness of the period is due to the determination of the occupation forces to suppress the resistance quickly before the occupation could become an issue and the outside world could justify its assistance to it. Despite the sheer quantity of interesting events, no historian in any language has so far studied the period as a unit in detail. 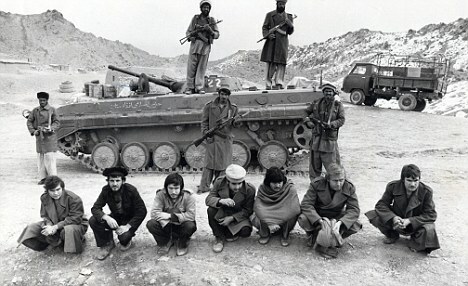 Impressed by the Soviet determination to subdue the Afghans, the English-speaking world paid only marginal attention to the resistance forces of a geographically remote neighbor of the Soviet Union. The Western world was under the impression that since the Soviets had dominated their neighbor countries in Eastern Europe, they would also dominate their neighbor country of Afghanistan. Afghan resistance was held to be unviable. 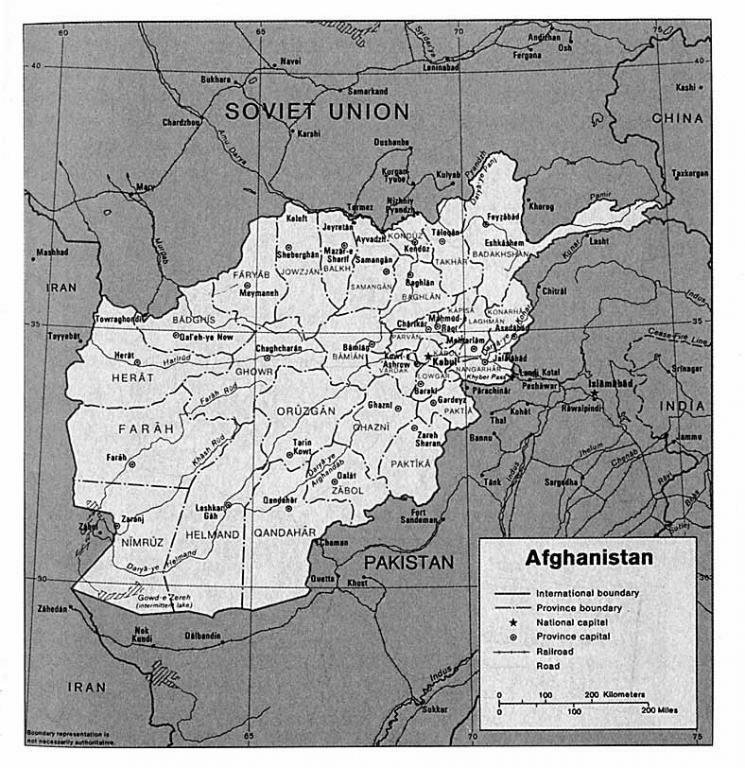 With that impression in mind, the Soviet Union and the regime it installed tried to isolate the hitherto nonaligned, independent, and Muslim Afghanistan from the outside world. Under these circumstances there unfolded a story of conflict between the fighting men of a Third World country, determined to preserve their national and Islamic identity, and the fighting men of a superpower that wished to bring them into the orbit of a communist state. This work deals with this confrontation. It is a political history that revolves around men, policies, and events. I describe only those aspects of the government and society that the Kabul regime tried to change. The work is, in short, an epitome of a political and military dynamism—or a dynamic vandalism—in which people are the central theme. The account is divided into four parts. Part 1 deals with why and how the Soviets invaded Afghanistan. The intervention unleashed powerful forces of resistance to the invaders and the client government; this resistance and the reaction of the Kabul regime are the subject of parts 2 and 3. Part 4 concerns a more intensified degree of this confrontation, an account of genocide that the occupation forces committed in an attempt to uproot the resistance. 1. For details see Kakar, Government and Society; Kakar, Afghanistan. 2. 2. 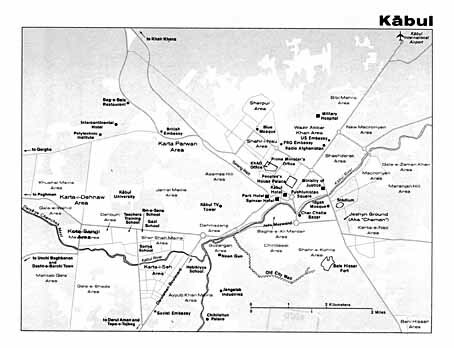 Kakar, “Trends in Modern Afghan History,” 24, 25. 3. Gregorian, Modern Afghanistan 352; Farhang, Afghanistan 1:426. 4. Gregorian, Modern Afghanistan, 363. 7. Farhang, Afghanistan 1:446-58; Dupree, Afghanistan, 494-98. 8. Ghaus, Fall of Afghanistan, 65-79. 10. Ghaus, Fall of Afghanistan, 90. 11. Poullada, “Road to Crisis,” 43. 12. Fayzzad, National Loya Jirgas, 232-96. I am grateful to Habibullah Rafi for giving me this along with a number of other books recently published on Afghanistan. Farhang, Afghanistan 1:485-93. 14. Ghaus, Fall of Afghanistan, 147. 2. Why Did the Soviet Union Invade?